Hermann's tortoise—along with the spur-thighed tortoise and the marginated tortoise—is part of a group of tortoises referred to as "Mediterranean tortoises." This attractive tortoise, with a yellow and brown carapace, thick scales, and strong legs, is highly coveted for its mild temperament and its sheer beauty. In the wild, Hermann's tortoises live in rocky hillsides and oak and beech forests of the Mediterranean region of Europe. However, due to habitat loss, falling victim to road kill, and over-collection for the pet industry, both the Western Hermann's tortoises and Eastern Hermann's tortoises are nearing endangerment. That said, captive breeding and conservation efforts have had a positive effect of repopulating the species. The passive and gentle Hermann's tortoise makes a great pet for the right person who lives in a suitable climate with plenty of outdoor space. This active creature likes to run (surprisingly), dig, forage, climb, and sunbathe. Male tortoises frequently interact and can engage in combat, especially during the mating seasons of spring and fall. During courtship, male tortoises excessively chase and ram the females, sometimes causing harm. For this reason, it is best to house males and females separately to avoid injury, bringing them together only to mate. Adult Hermann's tortoises do not fare well housed indoors. So keep this in mind before purchasing one. And since outdoor housing is strongly recommended, make sure you live in a climate that closely mimics that of the Mediterranean (Italy, Greece, Bulgaria, and Romania). Daytime temperatures should average around 80 to 86 degrees Fahrenheit (27 to 30 degrees Celsius) and shouldn't fall below 65 to 70 degrees Fahrenheit (18 to 21 degrees Celsius) at night. A tortoise habitat should consist of a shallow pan of water (preferably sunk into the ground), rocks, small trees and bushes, and a shelter to protect it from extreme weather and predators. The pen should also be escape-proof since these active tortoises tend to climb and burrow. If you decide to house your tortoise indoors, a fairly large enclosure is necessary (a 2- by 4-foot minimum). Provide a basking light or heat lamp that mimics the sun, complete with a basking spot (flat rocks work nicely) that has an ambient temperature of about 95 degrees Fahrenheit (35 degrees Celsius). It's also necessary to have a cool, shaded area for your tortoise to escape the heat. A mix of soil, sand, and composted cypress bark should make up the substrate in your pet's enclosure. The compost mixture should be about 2 inches deep so that your tortoise can dig and frolic in the dirt. Burrowing allows your tortoise to cool itself off, while also providing a way to thwart boredom. A shallow pan of water should also be provided for both drinking and cooling off. Make sure to provide one deep enough for your pet to immerse its whole body. If the enclosure or outdoor temperature drops below 50 degrees Fahrenheit, your pet tortoise may decide to hibernate. In fact, some species hibernate in the wild for up to five months, usually between October and April. For indoor tortoises, however, it is hard to maintain the environmental conditions conducive to a safe hibernation. Therefore, it's best not to let your enclosure temperatures drop to keep your tortoise active all year long. A tortoise's diet should replicate wild foraging. Choose a variety of leafy greens and grasses to feed your pet. Then, supplement with smaller quantities of vegetables (broccoli, cabbage, cauliflower, cucumber, and carrots) and fruit (apples, apricots, grapes, melons, peaches, and strawberries). For an indoor tortoise, it's particularly important to ramp up its nutrition since it is not directly exposed to sunlight. A tortoise food, complete with calcium and vitamin D3, works well. Wild tortoises also eat insects, slugs, and carrion, but if you supplement with these critters, keep in mind that feeding your pet too much animal protein can harm it. And since tortoises are particularly vegetarian, never feed your reptile dog or cat food. During mating season, turtles get aggressive, both male on male and male on female. So, tortoises should be monitored and inspected daily for wounds during this crucial time. Care for all injuries properly by first isolating the injured reptile. Next, clean the wound and remove debris. Then, apply an antibacterial solution like honey and dress the wound. 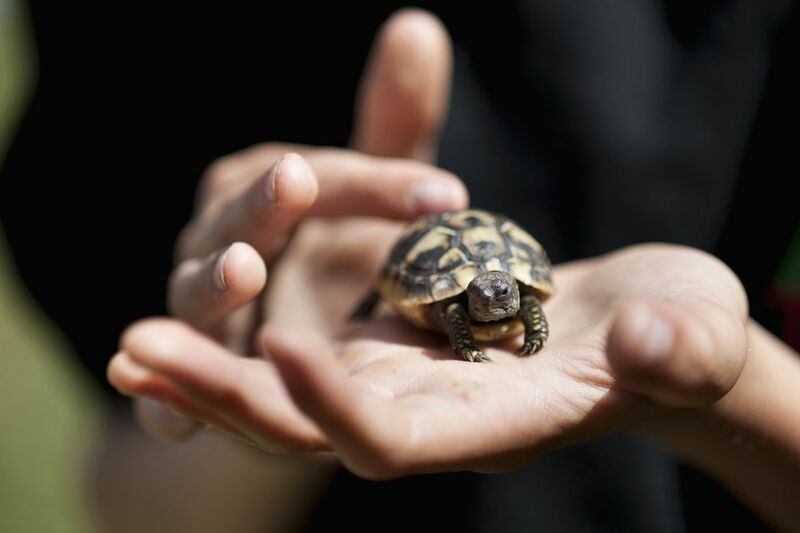 Take care in doing so, however, because tortoises don't like unnecessary handling and the stress could prolong healing. Unattended open wounds are prone to infection and provide a breeding ground for flies and maggots. Tortoises in captivity are also susceptible to a slew of other illnesses. Respiratory infection can occur in tortoises who have not been properly cared for. And environmental stresses or lack of fresh food and clean water can lead to an infection. If you suspect your turtle has a respiratory infection, take it to your exotics vet. He will most likely prescribe a round of antibiotics. With proper care and good living conditions, your tortoise should improve, although it may take several weeks to one month for full recovery. Metabolic bone disease can occur in pet tortoises due to a lack of calcium or a problem absorbing calcium. Since wild turtles bask in the sun for most of the day, a full-spectrum light is needed so that they can naturally absorb Vitamin D (a nutrient required for calcium absorption). Prevention is easy by providing the right conditions and proper nutrients. Still, if your tortoise shows signs of this disease—like a soft or misshapen shell—take it to the vet. Conditions need to be corrected and liquid calcium may need to be supplemented. If dehydration occurs, prolapse of the cloaca can happen when the bladder of the tortoise forms a "stone" which the reptile then tries to pass. If this happens, your vet will help your pet remove the stone and manipulate the organ back inside, sometimes resulting in a suture to fully heal. It is best to buy your tortoise directly from a breeder, both for the health of the pet as well as the survival of the species. Buying from a reputable breeder assures your pet has not been acquired from a source that's depleting wild populations. Breeders also offer superb care. Buying a Hermann's tortoise from a pet shop or dealer, however, is not recommended. Dealers may have obtained their tortoises from a non-reputable source and, often, the living environment they provide is sub-par, leading to a diseased pet. Otherwise, check out all of our other tortoise breed profiles.